This is quality hip hop straight from the frozen winters of the mid-west. 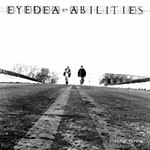 Eyedea and Abilities put it down on these great tracks! Lyrics by Eyedea and Blueprint. Music by Abilities.